The Wizard of Odds: Damaged Goods? 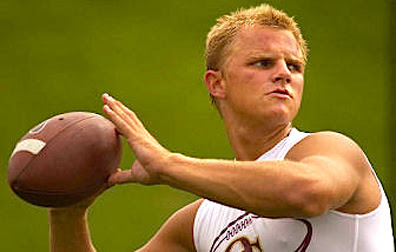 Jimmy Clausen, Notre Dame's can't-miss quarterback recruit, might be missing Wednesday when the Fighting Irish start spring drills. Clausen, who graduated from high school early and enrolled at Notre Dame in January, has an undisclosed injury to his right (throwing) arm, according to the Chicago Sun-Times. An earlier report in the Miami Herald said Clausen has bone spurs in the elbow, but Notre Dame coach Crewcut Charlie Weis, no stranger to the world of doctors (and lawyers), dismissed the claim in February. Still, officials aren't saying exactly what is wrong with Clausen and Weis kept Clausen from throwing during winter drills. Clausen's father, Jim Sr., said his son completed his final year of high school ball with the injury and that "at the end of the season, he started to lose some velocity." "I'm not a doctor, so I can't really tell you much about it. But it's going to be monitored,'' he said. The younger Clausen also has a website that you can view by clicking here. Thanks to Kevin of We Are Penn State. Weis said today in his first press conference of the spring that Jimmy is healthy and ready to go.